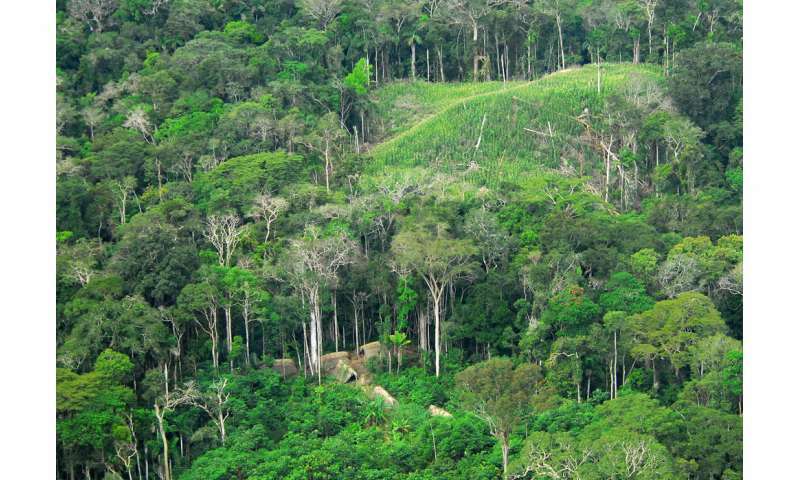 Environmental scientists from The Open University (OU) have discovered that trees growing in the Amazon floodplains surrounding the Amazon River emit as much methane (CH4) into the atmosphere as all of the world's oceans. These trees growing in seasonal wetland areas of the Amazon contribute between 15.1 and 21.2 million tonnes of CH4 to the atmosphere every year, comparable to 18 million tonnes from the oceans, or 16 – 27 million tonnes from Arctic tundra wetlands. Conducted in collaboration with academics from the University Federal of Rio de Janeiro, the Universities of Leeds, Linköping, British Columbia, and other partners, the research measured the gas emissions from the trunks of over 2,300 Amazonian floodplain trees. It found that the trees, which act as chimneys, funnelling the methane produced in the soil, are the source of the largest diffusive emissions ever recorded in wetlands. "Methane is around 34 times more powerful than carbon dioxide at trapping heat in the atmosphere so it is really important to understand where this gas comes from in both natural ecosystems and from human activity. "Great swathes of the Amazon become flooded forest for a large part of the year, which are ideal conditions for the production of methane. However, methane emissions measured from the water surface over the last few decades didn't add up to what satellites and models were suggesting was the real amount of methane coming out of the Amazon. We have discovered that large emissions from trees, sometimes flooded by up to 10 meters, fill this gap." "We are not, in any way, saying that trees are bad for the environment – this is how natural forests function. We now have a fuller picture of the sources of greenhouse gas emissions and this could help to inform how environmental change can have a knock on effect on the tropical wetland methane source. "Emissions from these Amazon trees are still only half as much as those created by humans in the form of landfill and waste, so we should be targeting reductions in human emissions," continued Pangala. "This also includes the dairy and meat industries, and fossil fuel emissions, such as from fracking." The research, "Large emissions from floodplain trees close the Amazon methane budget," is published yesterday in the journal Nature. According to the article, the Amazon flood plain produces up to 21 million tons of methane per year, the oceans produce up to 18 million tons of methane per year and the arctic tundra produces up to 27 million tons of methane per year, a total of 66 million tons of methane. Since methane is 34 times as effective at greenhouse heating as carbon dioxide, 66 million tons of methane is equivalent to 2.244 trillion tons of carbon dioxide. Also according to the article, we should not be concerned about the the greenhouse effect of this amount of methane because it is natural and we should only be concerned about methane if it is produced as a result of human behavior. Doesn't make sense, but what about AGW does? Check your calculation, you are out by several orders of magnitude, 2.2 billion. The reason that this doesn't contribute to global warming is that the emission of methane has been going on as long as there has been an Amazon rain forest. It doesn't factor into the current conditions except to assist in forming a baseline. "Methane is around 34 times more powerful than carbon dioxide at trapping heat in the atmosphere so it is really important to understand where this gas comes from in both natural ecosystems and from human activity." What people need to understand is how much methane is going to affect global temperatures. Telling us that methane is 34 times more powerful than carbon dioxide really doesn't do that. Methane is (___%) of the atmosphere and increases (___%) annually. This is projected to cause a (___C°) increase in global temperature by the year 2100. Your post literally answers your own question. I love how you can go "why do they say this ongoing natural source of methane isn't going to increase temperatures but our large-scale additional GHG output will?" Hmmm... let me think. It's a stumper. You did not incorrectly paraphrase my comment, you just made up something and pretended I said it. I said "Doesn't make sense, but what about AGW does?". It does not make sense to note that tremendous amounts of naturally occurring methane are not of any concern but methane produced by human activity is of grave concern. If greenhouse gasses should be of concern, all of them should be of concern, regardless of source. You did not incorrectly paraphrase my comment, you just made up something and pretended I said it. I said "Doesn't make sense, but what about AGW does?". It does not make sense to note that tremendous amounts of naturally occurring methane are not of any concern but methane produced by human activity is of grave concern. If greenhouse gasses should be of concern, all of them should be of concern, regardless of source. Let's say that average temps are 25 degrees celsius, maintained by a certain level of naturally-occurring GHGs (because that's what GHGs do). Are you really asking why those stable levels aren't causing temps to rise but ADDING a whole heap of extra GHG is? No. Im saying if you are concerned about limiting greenhouse gases, all sources of those gasses are potential areas for limiting those gasses. But of course, the question is always about limiting human activity, not about controlling greenhouse gasses or even about climate, other than as a means out controlling human activity. It is clear that the goal is not controlling greenhouse gas emissions since only human sources are even considered. Since I doubt you're seriously asking me why we aren't considering chopping down the Amazon to stop its methane emissions then I'm going to ignore the stupid and simply say this. You are wrong. We absolutely consider non-human emission sources in our models and in our interventions. For example, rising temps causes plants to emit more methane. So the issue here is the *increase* in methane output of these forests in the future. Also methane output of melting permafrost. These are positive feedbacks that will exacerbate changes causes by a rise in human emissions. Of course we'll try to limit the emissions we can easily control. Wrong, it does make perfect sense. We cannot do much about naturally occurring methane but we CAN do much about the methane WE produce via our own actions. Obviously, we should have more concern for the harm we can prevent rather than the harm we can do absolutely nothing about. How does that make NO sense? You begin by deciding that nothing can be done to moderate naturally occurring methane emissions. Then you say we should do something about human methane emissions since we cannot do anything about naturally occurring emissions. You predecide to support your position that human emissions must be stopped while you can ignore natural emissions. Personally, I don't care about natural or man made methane, just pointing out that the discourse is weighted to control human behavior. It is not about climate or all sources of methane would be considered important. It's more than denial. It's an utter lack of knowledge about how the climate system works. I mean, if you don't understand what the EGE is and the way in which it determines our climate then why are you commenting on articles on the subject. I feel like I just went five rounds with somebody going, "But if you can drown, then why do we let people drink water? If water's dangerous then why aren't you concerned about all this water consumption? Why insist on childhood swimming lessons and put up warning signs in swimming pools and hire lifeguards but then have WATER DRINKING FOUNTAINS NEXT TO THE POOL". And you're left scratching your head wondering if they just didn't bother to read what they just wrote. I feel like the entire education system these days should be solely devoted to learning, "It's about the dosage, stupid". So much derp could be avoided by that alone. Just think - anti-vaxxers, climate change deniers, anti-GMO crazies and organic wingnuts. If they'd all just learnt, "It's about the dosage, stupid", the world would be a much better place. You have made it abundantly clear that you only care about greenhouse gasses produced by human activity. I knew that all along and when I pointed out that you only care about human produced greenhouse gasses. You don't have to keep saying that you only care about greenhouse gasses produced by human activity. But I am sure you will because you can't insult people unless you repeat yourself over and over again.